“When the company PharmaProduct Manufacturing (PPM – ‘French medecines produced in Cambodia’) was established in 1996, no one expected the extent of success it would achieve at the Cambodian market and around the world. But 14 years later, this Cambodian pharmaceutical plant is very successful in exporting pharmaceutical products to foreign countries. At present, Cambodian medicines produced by PPM have established their markets in 15 countries around the world, because the quality of Cambodian medicines produced by PPM is recognized. “Representatives from 13 countries dealing with medicines produced by PPM met in Phnom Penh during the annual convention of PMM, which coincided also with the 50th anniversary of the invention of [the antalgic drug] KINAL. During the meeting with foreign representatives from 13 countries in the evening of 8 February 2010, the director of PPM, the pharmacist Mr. Hai Ly Eang, reported about the success of Cambodian medicines made by PMM at foreign markets, and pointed to the plan to further strengthen foreign markets. “The foreign importers of PPM products are from Burkina Faso, Cameroon, Congo, Gabon, Guinea, Ivory Coast, Mali, Mauritius, Niger, Senegal, Tchad, Togo, and Vietnam. “He added that representatives of these countries significantly contribute to support PPM to progress at the markets in their countries. The sales of PPM medicines keeps on increasing every year in the 13 countries from where their representatives participated at this occasion in Cambodia. “The leader of PPM called on and encouraged all foreign distributors to continue to support PPM. “Besides, PPM announced to expand its markets in the country as well as abroad. The expansion of markets abroad for medicines produced by PPM will be made by spreading a deeper and more intensive understanding of the quality of the PPM pharmaceuticals. “When Cambodian citizens and doctors use more medicines directly produced by Cambodia, it creates not only jobs for Cambodian people who work at pharmaceutical plants, but it also prepares the way for a future, where Cambodia can produce enough for itself and can control its medicines and the health sector. The Mirror carried already last week a report about the extraordinary speech of the Prime Minister: “It Is Time to Stop; Military Officials Who Do Illegal Activities Are Not Fit to Work in the Royal Cambodian Armed Forces” – where he directly named several generals present, criticizing their unacceptable, corrupt behavior. During the present week, there were still positive responses in the press, including from sources not so close to the government. Human Rights Watch, a US based organization, often very critical of the political climate in Cambodia, also supported the Prime Minister’s warning to commanders over their corrupt, illegal actions. And the Prime Minister himself continued to speak according to the same line, when he attacked nepotism, warning that nobody should nominate relatives and partisans for public office. These are pessimistic views, assuming and expecting that rights can be enjoyed automatically, while history shows in many different cultures that rights have to be fought for, even if they are written in the law, when other powers violate them. The Prime Minister has spoken clearly. “A group of people in Chumkiri, Kampot, filed a complaint in the provincial court against members of an army unit they say are encroaching on their land and cutting down their fruit trees, escalating a standoff that began in 2001… The court complaint comes less than one week after Prime Minister Hun Sen warned top military officials to refrain from participating in illegal land-grabbing operations. But did civil society always fail in demanding respect for human rights? It is not clear on which basis this is said, and which understanding or misunderstanding of the term ‘civil society’ is used when saying so. First, there is no general, clear definition of this term. But it refers to all movements, associations, or individual citizens, independent from the state, whose aim is to improve policies, standards, or social structures, through common efforts. Civil society – that are organizations formed for these purposes – civil society organizations, non-government organizations, citizens action groups – but civil society is also all individual citizens in a social unit – be it a residential region, or a common interest group (for example enjoying sports or music, and caring together to see that the proper space is set aside for these purposes). Civil society is citizens who organize themselves to care for the quality of life where they live. Civil society is also the majority of the citizens of Phnom Penh, who, in their majority, do not care that the Boeung Kak lake in this city is being destroyed, being filled up with sand for the benefit of some business interests to construct a commercial and housing center – though the plans have not even been made transparent and publicly know, leaving all the struggle for rights to the several thousand people who are directly affected, because they lose their traditional environment and with it also their means of living. On 31 August 2008 The Mirror had reported the following: “Later in January 2008, Areyathor reported that Samdech Heng Samrin, the President of the National Assembly – and also a Honorary President of the Cambodian People’s Party – had signed a letter for the suspension of pumping of soil to fill Boeng Kak lake, and the paper reported also that the Phnom Penh governor and vice-governor allegedly disagree with each other about filling Boeng Kak lake.” We are not aware that the press has done any follow up on these reports. 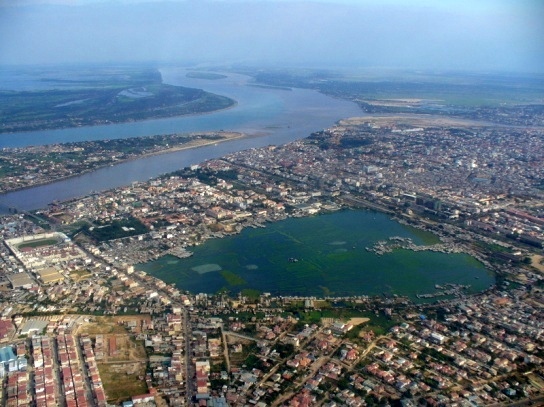 But the public is aware that the lake is gradually disappearing, that many residents had tried to organize themselves to jointly represent their concerns and demands, and that some of the remaining residents around the lake are at present living on top of rising dirty water, as the promised pumping for stagnant dirty water – as a result of the filing in of sand – was installed too late and is not strong enough. Recently I had the opportunity to be in Myanmar, and to have dinner one evening at the Kan Taw Gyi lakeside – a wide park where hundreds of people enjoy walking around or sitting together, with a music stage, very many small restaurants, and a wonderful view. 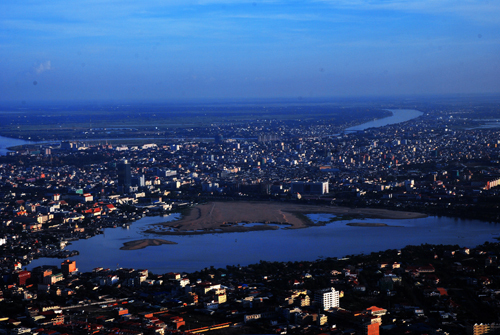 Phnom Penh is destroying such a possibility for its future. At the Kan Taw Gyi Lake in Yangon/Myanmar. 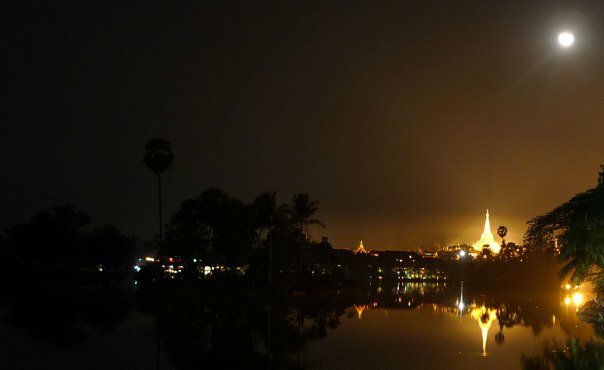 Does civil society – the people in general in Phnom Penh – care? Or why not? A problem faced by some powerful leaders is that they do not know what is really going on under their control – there is a layer of advisors and assistants who keep important information from reaching the top, or the arrangements for the activities of persons in high level leadership do not provide sufficient opportunities to see what happens on the ground. Some years ago it the Prime Minister traveled by car on a major road of the country, over which he normally used to fly by helicopter – and it was then reported that he was surprised about the poor state of the maintenance of the road, ordered its repair as a priority, and decided to travel by car more frequently to see some of the reality which he cannot see from high up in the air. Sometimes it is also questioned whether other important information is really reaching the Prime Minister, or whether it is filtered away by advisors and assistants. In 2003, there was a embarrassing situation, when one of his nephews, Nim Sophea, was accused to be involved in a shooting affair, which left three people dead and four others injured. The nephew was arrested and convicted, but in an appeals process he was declared to be not guilty (the main culprit had fled and was never found – if I remember correctly). Around that time, the Prime Minister said that even his nephew would have to face the court – though, at that time, the media had already reported that Nim Sophea was already in China. This information had not reached the Prime Minister, so he did not know. The Prime Minister’s speech on 28 January 2010, during the closing ceremony of a conference at the Ministry of Defense, is different: it shows that he knows very well what is going on. He did what was hardly ever heard before in public: he named several high ranking military leaders, present at the meeting – Sum Samnang, director-general of logistics and finance at the Ministry of Defence; Chao Phirun, director-general of materials and technical services; Ung Samkhan, commander of the Royal Navy; and Chhoeun Chanthan, chief of the senate president’s bodyguards – accusing them of corrupt actions: misusing their positions for their private business, using military equipment and personnel for personal gain, and wasting public property. In spite of these special considerations, this is an extraordinary situation which does not happen easily: that the head of the government, the spokesperson of the largest opposition party, and a respected leader in civil society immediately agree. Fellow soldiers did not do so in the past, because they could not expect that they would be supported at higher levels, as also some of the examples repeated above from the past week show. It will therefore be decisive to see what procedural changes will be established, and how their implementation will be monitored – by the public and the media – and enforced by the relevant institutions of the state. “Phnom Penh: The top Five-Star General, Samdech Akkak Moha Senapadei Dekchor Hun Sen, announced that from now on, military officials who are involved in illegal activities are not fit to work in the Royal Cambodian Armed Forces, because they destroy the reputation of the armed forces, the reputation of the soldiers. “He announced this in the evening of 28 January 2010 when he presided over a workshop at the Ministry of Defense to reflect on the reform of the Royal Cambodian Armed Forces during the last five years (2005-2009) and to set the direction for the activities for the next five years (2010-2014). “He emphasized that some perpetrators are not real soldiers, but some are real soldiers and do illegal logging or violate forest land. Some generals really do illicit activities. It is time to find land for veterans who cannot perform military duties any longer, and for families of soldiers who sacrificed their lives. It is the time to find land for those people, not to find land for high level military persons. “Mondolkiri: The Mondolkiri provincial authorities had decided to cancel the concessions of 50 companies that had planned to invest in agriculture in Mondolkiri, because those companies do not operate. “According to different sources of information, some companies received economic concession land in Mondolkiri, but they do not develop anything following their contracts, and some cut trees and sold them, affecting the lives of the citizen. Therefore, the authorities decided to cancel the concession contracts of those companies. “The new Mondolkiri provincial governor could not be reached for comment regarding this issue, because he had a meeting. The Mondolkiri deputy governor, Ms. Si Sokuntheary, could not be reached either, as she was busy. Anyway, according to a notification by the Mondolkiri authorities dated 4 January 2010 that Kampuchea Thmey received on 8 January 2010, the Mondolkiri authorities announced to cancel the concessions for land of 50 companies located in Mondolkiri. This was done by a letter dated 25 December 2009 of the Mondolkiri authorities canceling the legal validity of the concessions giving control over concession land by 53 companies. But 3 companies asked for a delay.